With summer just around the corner, I just had to dig these out of the vault of my personal photos from last summer. These photos make me think of everything good about summer and being a mom. I love watching the world through my kids eyes. I will admit that my eyes popped out of my head a bit when I saw this scene. I had returned home from a summer night photoshoot and with a smile, Derrick said, "you better take your camera back there and see what they are doing." I figured it had to be good if Derrick was telling me to go take photos. When I saw this scene, I immediately laughed. Just pure joy and summer! But then I thought, what if there is some disease in that mud pit? What if someone steps on a nail (they later did), or what if someone runs through my house and sits down on my brand new grey tufted couch or white chair? While I am a pretty laid back and joy-seeking parent, I do dance around with the "what if thinking" once in a while. Tony Robbins, one of my favorite Personal and Business Coaches, always says, "stay in your head your dead". Your head is good for planning, strategy and worrying, but it will never bring the joy like your heart will. Your heart will let you experience the juice of a big fat piece of sweet watermelon on a summer day. Your head will say, "Is is it organic? Where did it come from?". So, stay out of your head unless you are making a spreadsheet! This is something I teach my coaching clients and something I remind myself of. After running a few of the worst-case mud-pit scenarios through my head and looking around at the night, I just said.... "nope, Shannon, this is an experience....let's do this!" I mean, really, this is our one life. 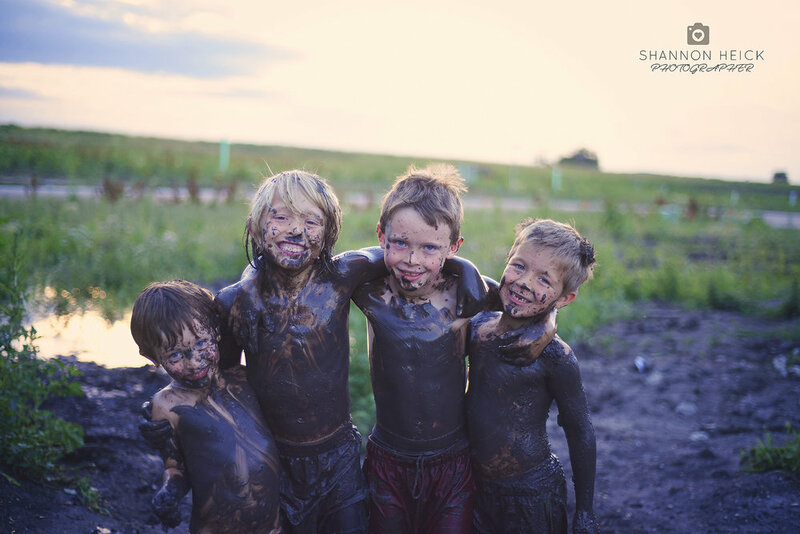 We all get just one shot and we all desperately need to re-learn the joy of jumping in mud pits in the spirit of spontaneity. So, go ahead and check out these photos and give yourself permission to find some joy this summer!